I had an idea to paint my own Christmas cards this year. 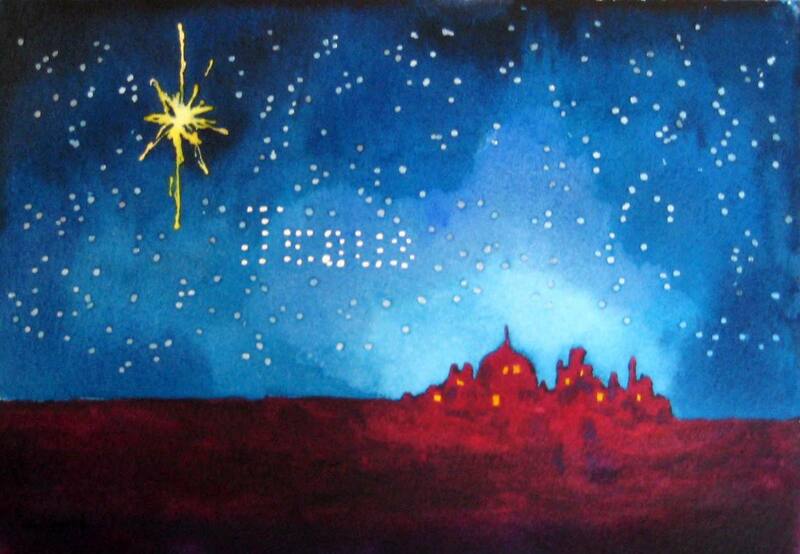 I knew exactly what I wanted to paint for our cards – the little town of Bethlehem with the stars shining above it. I’m not sure what compelled me to do this, because I never send out Christmas cards. I’m just not the Christmas card sending type. It falls under administrative duties and I don’t have the gift of administration. In fact administrative stuff really stress me out – I would make a horrible secretary! I painted the Christmas cards and then, because I don’t send Christmas cards, I just stashed the little paintings aside. A few of my friends were looking through my paintings and they all loved these little paintings of Bethlehem, so I thought I would share them in my blog for some holiday posts. I guess you could kind of consider this a blog Christmas card – does that count??? If it does then I can say for once I sent out Christmas cards :). Let’s consider it official – here’s my Christmas card to you: “Merry Christmas from Grady and Sandi”! I made two pictures of the little town of Bethlehem. I’ll post one now and one later in the month. Hmmm, that means you’ll be getting TWO Christmas cards from me – wow, I’m outdoing myself this year :). Oh yea, I’m not sure if you can see it or not, but the name of Jesus is in the stars. that is so good!!!!!!! I love this one! thanks for my card 🙂 !!! Thank you Carrie – you’re very welcome for the card too :)!